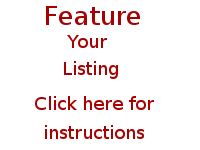 - This car is clean and in excellant condition, Never abused, dunes awesome, extremely dependable needs absolutely nothing. 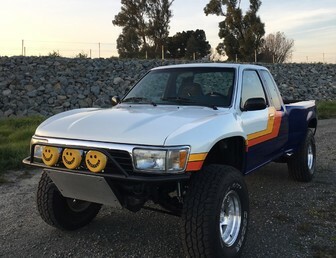 2016 Tatum Prerunner “Punsher” car. Car used very little with no money spared on build. 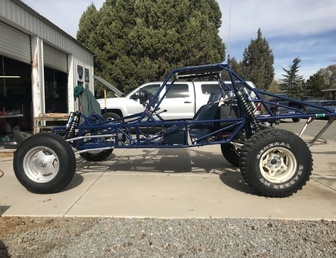 I’m selling my psd Motorsports sand car. It has a ls1 with about 520hp. Mend 2d trans, gps, radio intercom headsets. Cars is extremely reliable and fun to drive. I’m the original owner and always had regular maintenance. 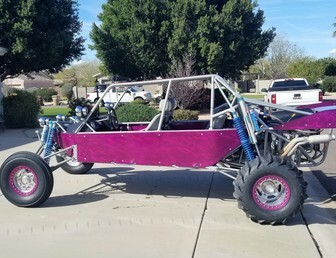 2004 Suspensions Unlimited Sand Pro 2 with LS2 engine, recently refreshed Mendeola 2D trans, Fox triple by-pass shocks and much more. All new LED lighting including 8D light bar, interior light, four front LED lights. •	Brand new powder coat on wheels and new front sand blaster sand 33” front tires. Rear 33” blasters in excellent condition. •	I have original light bar from SU that also comes with the car and several extra parts including spare CV joints, and spare dual radiator fans. Car runs flawlessly and is ready to head to the dunes with its next owner. Call or text for any questions or additional information. Many great dune rides were had in this car Sand Mountain, Glamis & Dumont. It’s a low slung light weight car with good suspension that rips. This car is ready for your engine of choice to be installed, and you’re duning. Put a nice VW or Subaru engine in this car and you will not be disappointed. 14” coilovers in the rear and 10” in the front. Main chassis powder coated blue, front A-arms silver. The chassis is tabbed for side panels and front floor panel. All hydraulic lines are stainless steel or steel braided. This car is ready for a water-cooled engine and has a radiator and fan, but will also support an air-cooled engine as well. Rear engine cage has skid plate mounted but needs powder coating. Fox piggy back coilover shocks all four corners ---Beard Racing suspension seats---5 point crow racing belts---CNC peddle assy---CNC turning brake---Jamar shifter---Intelidash gauge cluster---microstub rear disc brakes with wilwood calipers---new rear sand paddle tires on Douglas beadlock wheels---rear dirt tires---Built 091 Transmission with all weddle internals ---spare 091 transmission level 2 weddle performance---safeglow whip---5 HID offroad lights---930 lightweight race prepped cv joints---High torque starter.---bosch high pressure fuel pump. Radiator with fan & shroud. 10 gallon JAZ fuel cell. All the service work is current and up to date. Funco Gen 3 with 2.5 C&G SUBI Turbo , runs on 110 set at 10psi , Mendi 2D , Beard seats rear bench , OMF Bead Locks , Radiator had a very small drip so I replaced it 4 trips ago, car runs perfect and is driven by my wife . call anytime. This Manufacturer may not be as well known as some of the other big name builders but the quality of their cars is on par with the best in the industry.